Caiman free games: Zwarte Piet by Mike Wiering. 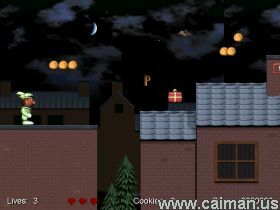 In this multilingual (Dutch/English) platform game, you must try to collect all the presents and cookies and take them to the correct chimneys, while facing many kinds of dangers. The colors of the presents correspond with colors on the chimneys and each chimney has the number of required cookies written on it. Time is unlimited and you must stay on top of the roofs. If you do well, you might even find a bonus level. The graphics and the animations which were rendered in POV-Ray are excellent. The sound effects and music are quite good and the game play is very good. There is also in game help and other information. You high scores are saved. There are a few options and these are controlled by the command line or can be entered into a windows shortcut after the program (Piet.exe) name. Command line options include: width, height, bpp (color bits), faster (no background) and nederlands (Dutch texts). The previous example would give a screen resolution of 1024x768 with 32 bit (millions) color and all the text would be in Dutch. 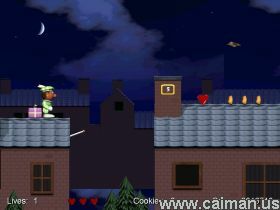 Zwarte Piet is a high class platform reccommended for anyone who likes these types of games. PMM2: The TPS aliens ar.